With respect to the Cycladic architecture and the surroundings we created Byzantio Beach Suites & Wellness on Tinos Island. Here, the panoramic sea view, the beautiful gardens with the palm trees, the aromatic herbs and the sandy beach compose the ideal environment for your holidays. 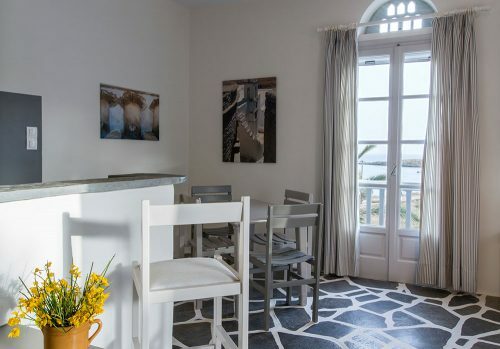 The establishment consists of eight (8) elegant beachfront apartments renovated in 2015 fully equipped and fully furnished that can accommodate two to six guests. 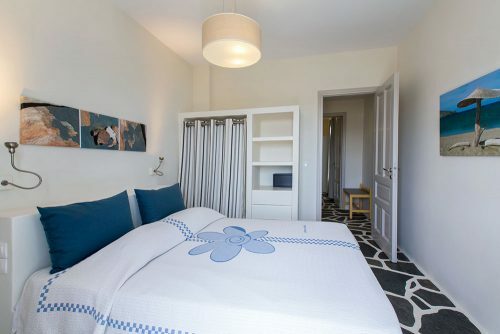 We have named our suites, studios & apartments Kalloni, Pyrgos, Agapi, Triantaros, Volax, Dyo Choria, Kardiani & Ysternia. These are the names of some historic, picturesque and “must – see” villages of Tinos Island. 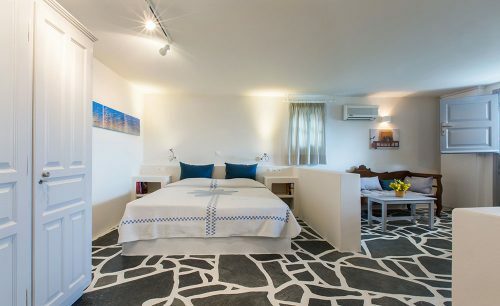 All the apartments gaze upon the Aegean Sea and the adjacent islands of Mykonos, Diles & Rinies and Naxos. 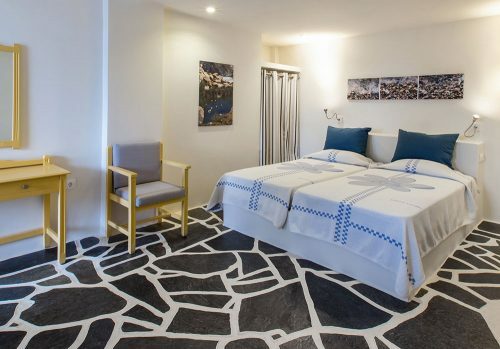 Mega suite on the second level floor with three bedrooms and two restrooms, consisting of one double-bed bedroom and two single-bed bedrooms, comfortably sleeps six guests. Private huge balcony with nothing else but sea and garden view. Approximately three minutes from the beach. Master suite on the third level floor with two bedrooms, consisting of one bedroom with one double-bed and a second bedroom with two single-beds, comfortably sleeps five guests. Private balcony and enormous private veranda gazing upon the Aegean sea and the adjacent islands of Mykonos & Delos. Approximately two and a half minutes from the beach. 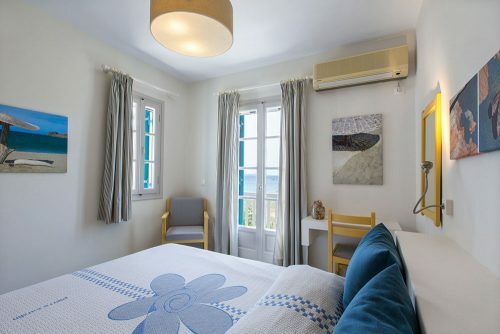 Studio on the ground level floor with two single-beds and a private veranda with garden and sea view. Approximately two minutes from the beach. Studio on the second level floor with two single-beds. Private balcony with sea and garden view where you can enjoy your breakfast or dinner. Apartment on the ground level floor with a single bedroom consisting of two single beds, comfortable sleeps three. Private veranda with amazing sea view where you can enjoy your breakfast or dinner. Our entirely stone build studio-apartment on the ground level floor with two single-beds, comfortably sleeps four guests. Private veranda with garden and sea view where you can enjoy your breakfast or dinner. 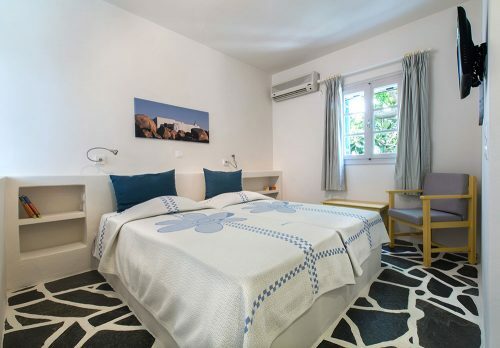 Suite on the third level floor with two bedrooms and two restrooms, consisting of one bedroom with one double-bed and a second bedroom with two single-beds, comfortably sleeps six guests. 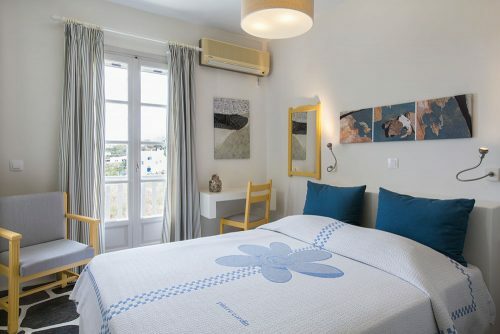 Private balcony and shared veranda both with dazzling sea view of the Aegean Sea. 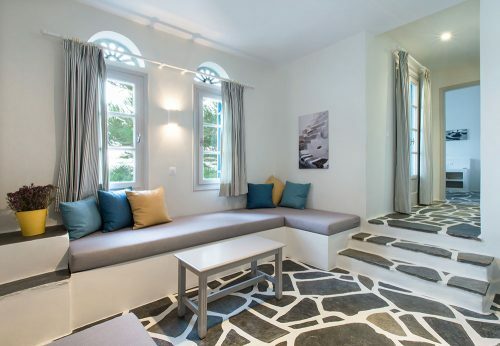 Suite on the third level floor with two bedrooms, consisting of one bedroom with one double-bed and a second bedroom with two single-beds, comfortably sleeps five guests. Private balcony and shared veranda with breathtaking view of the Aegean Sea.